I have just arrived in Ise, having taken a high-speed Shinkansen or "bullet train" from Tōkyō to Nagoya, then a JR Line Express train to Ise-shi, the main station in Ise. Ise is a city of about 130,000 people. It doesn't seem nearly that large to me, as everything is compact in Japan. Also, everything is very efficient, so it's as if there's relatively little traffic, little crowding, and certainly no confusion. 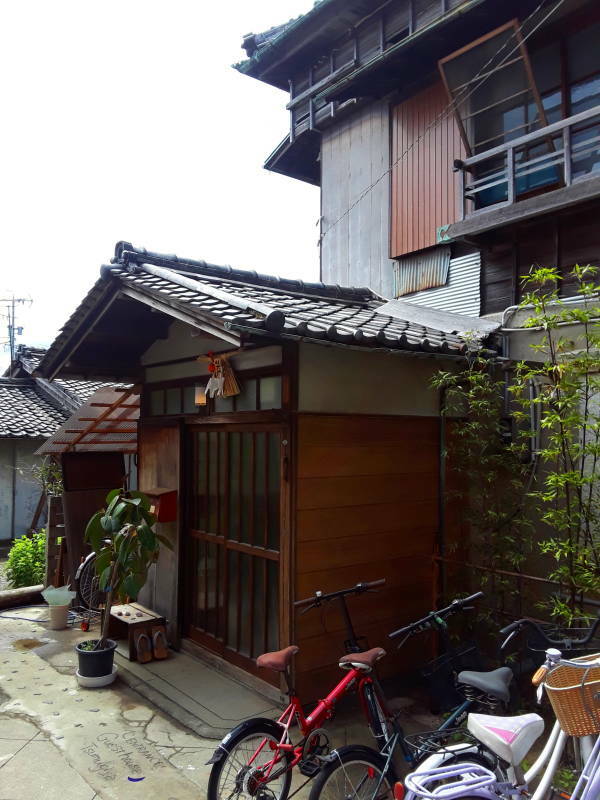 I had a reservation at Guest House Tsumugiya, a hostel that's much like a ryokan or traditional Japanese inn. It made for a very nice place to stay. 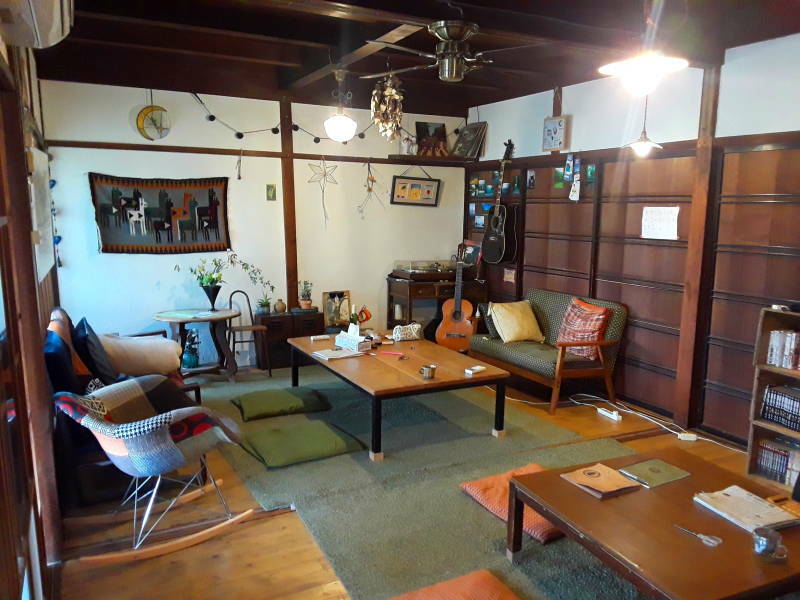 Quite comfortable, friendly hosts with helpful advice, and fellow travelers to talk with if you have enough language in common. 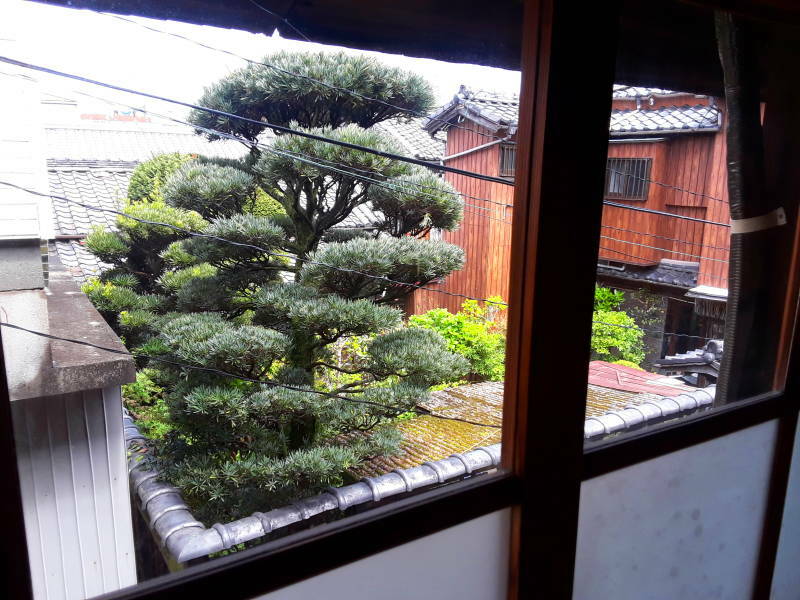 Japan has had ryokan for a long time. Nishiyama Onsen Keiunkan was founded in 705 AD and it's still in operation. It's the world's oldest operating hotel and one of the oldest companies in the world. 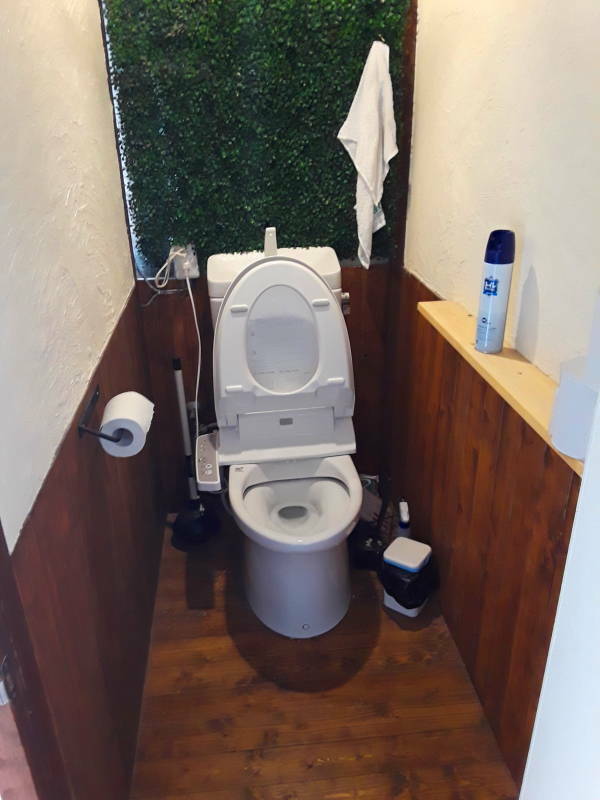 Traditional ryokan can be rather expensive. 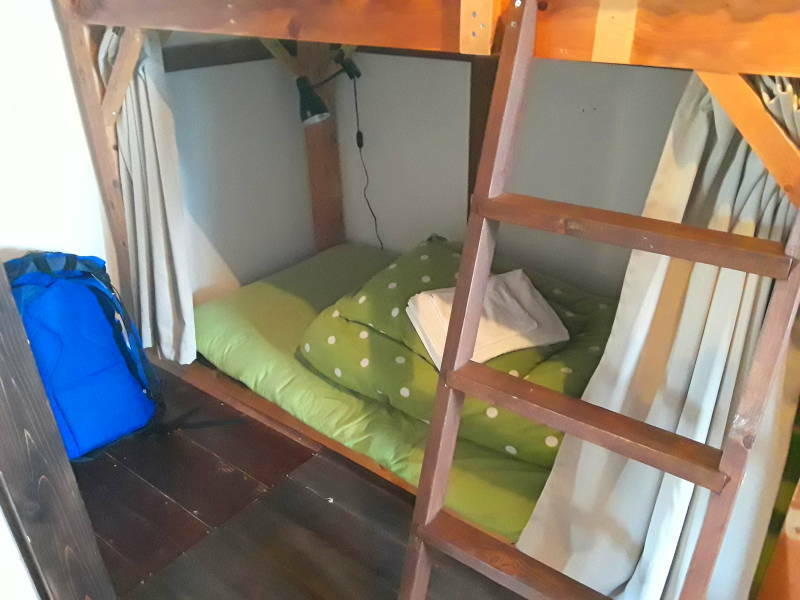 However, my bed at Tsumugiya was just ¥2,600 per night, about US$ 24.30. 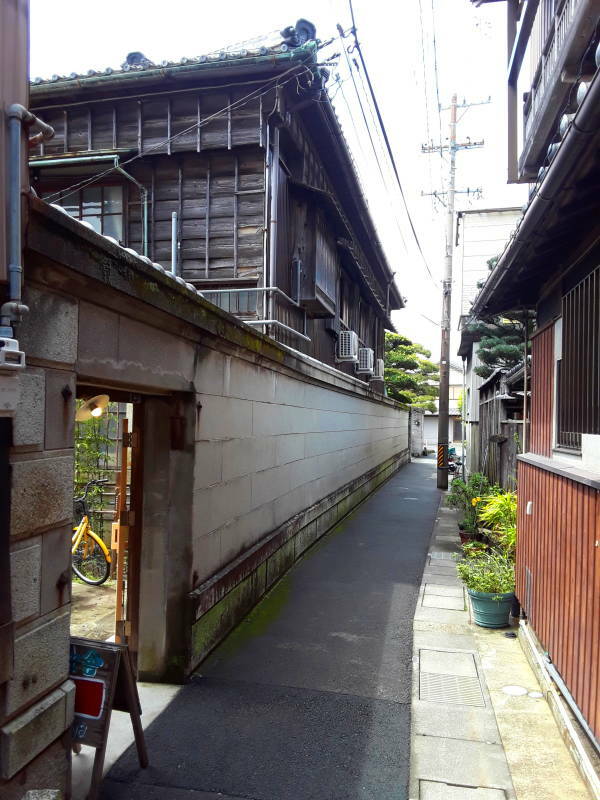 Tsumugiya was of very traditional construction. 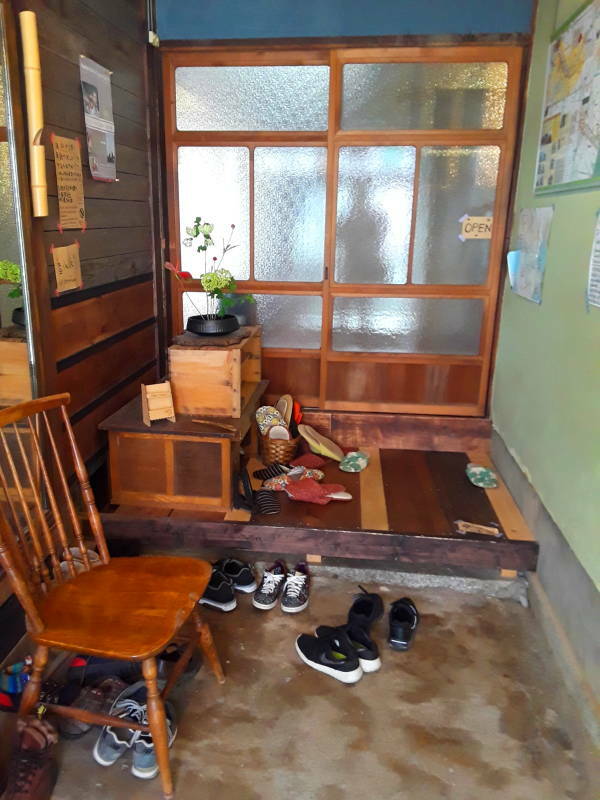 Tatami or straw mats on the floors, sliding doors, and wood everywhere. It was constructed as a merchant house in the 1910s. I was glad that I had GPS and Google Maps on my smart phone. It's several blocks from the train station, first southeast and then north along a main street, crossing one set of tracks and going under an elevated line. 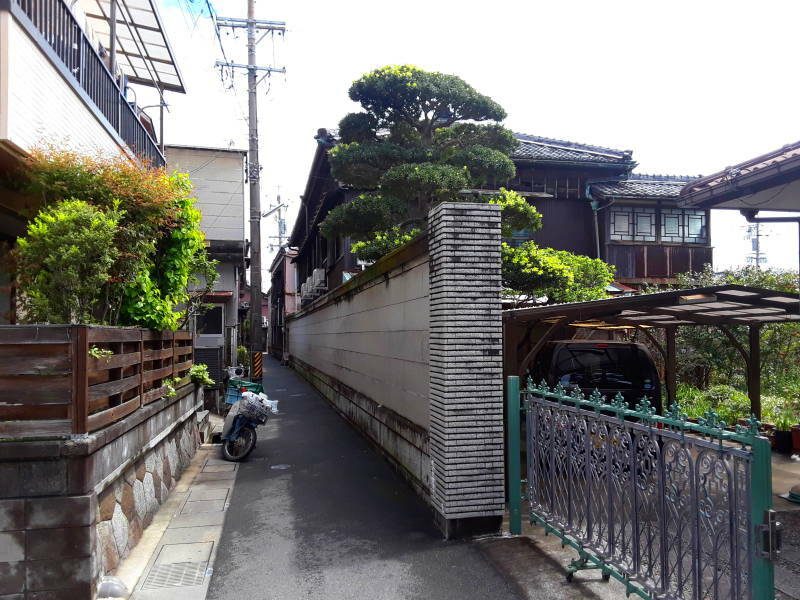 Continue north, then go back behind the Family Mart, and then back a narrow alley. There it is, the tall dark building on the right. I've walked just past the entrance. Like many places I stayed, the hosts are gone from mid-morning until about 1500 or 1600. Plan ahead, be ready to do something else or wait until you can check in. But now the gate is open. 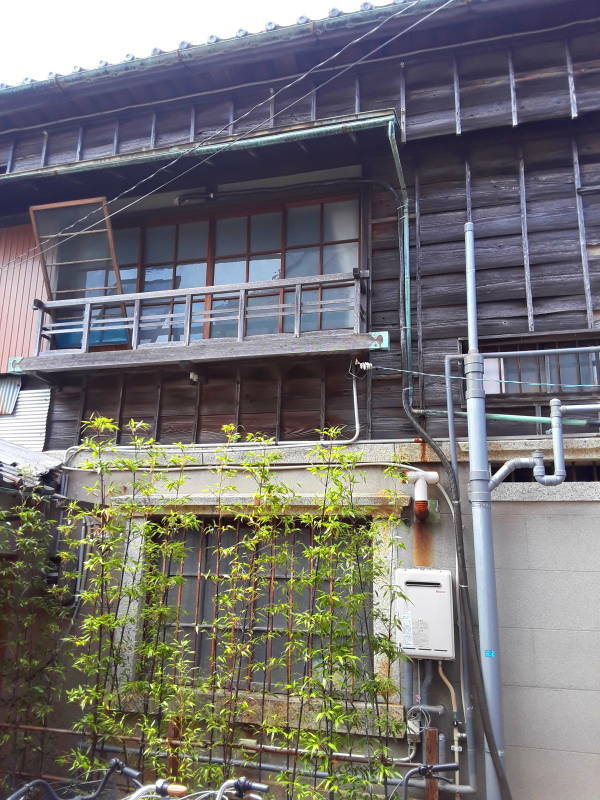 There are a lot of older and traditional buildings in Ise. 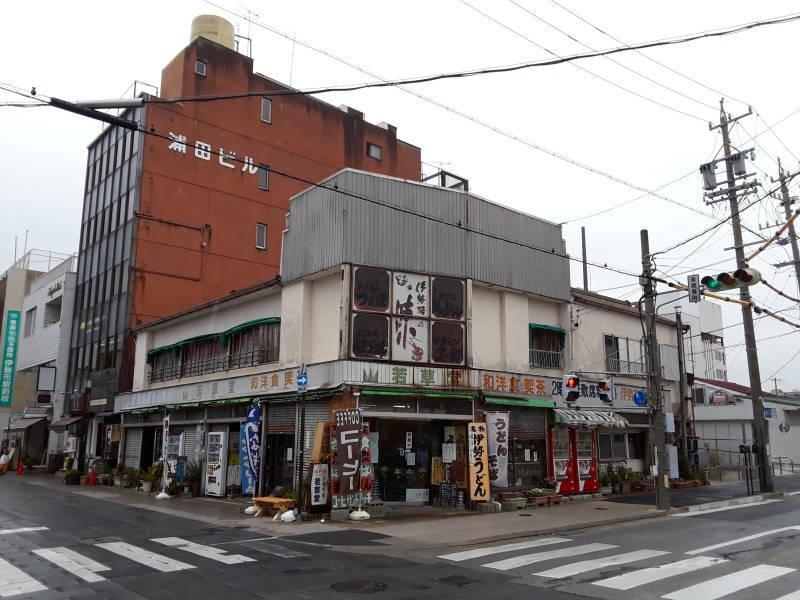 It was and still is the heart of Shintō and therefore Japanese culture, but it had very little industrial or strategic value during World War II. Ise was only lightly damaged until just a few weeks before the war's end. A raid by 93 Twentieth Air Force B-29 bombers dropped incendiary bombs on the night of July 18, 1945, burning 39% of the city. Let's enter through that gate in the outer wall. Let's go in! Of course you remove your shoes before stepping onto a wooden surface. 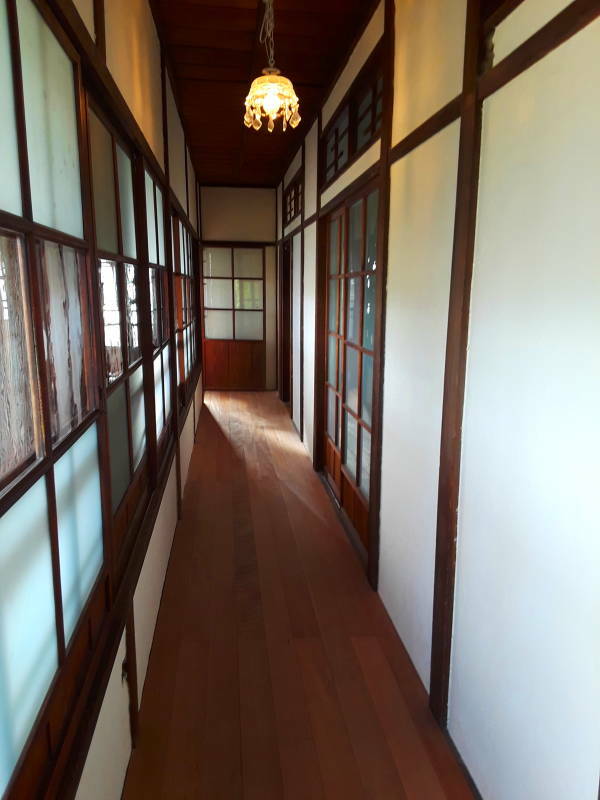 As I said, there's wood everywhere in traditional Japanese architecture. 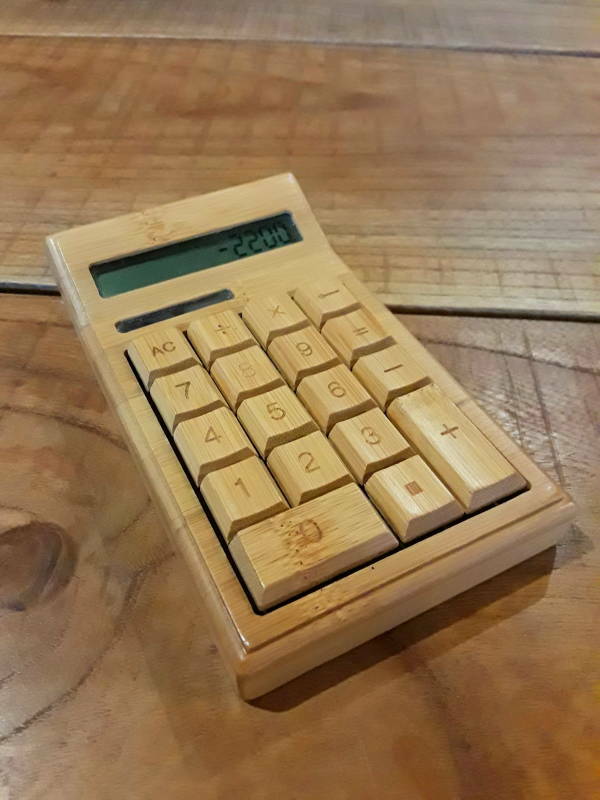 I had never seen a wooden calculator. Time for a quick tour. Here's the large shared room downstairs. Everyone else was out seeing and doing things when I arrived. 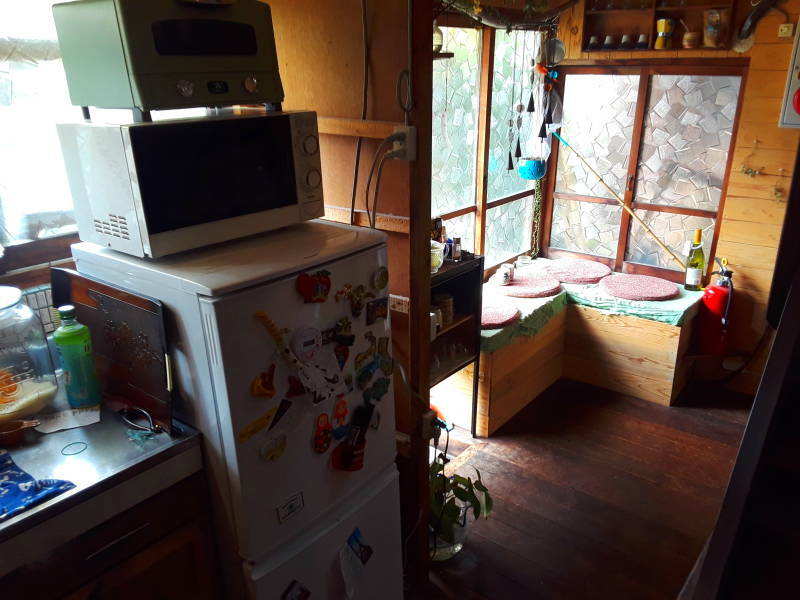 There's a kitchen area if you want to store or prepare food. Here's the main electrical panel. 40 amps total service for the house. 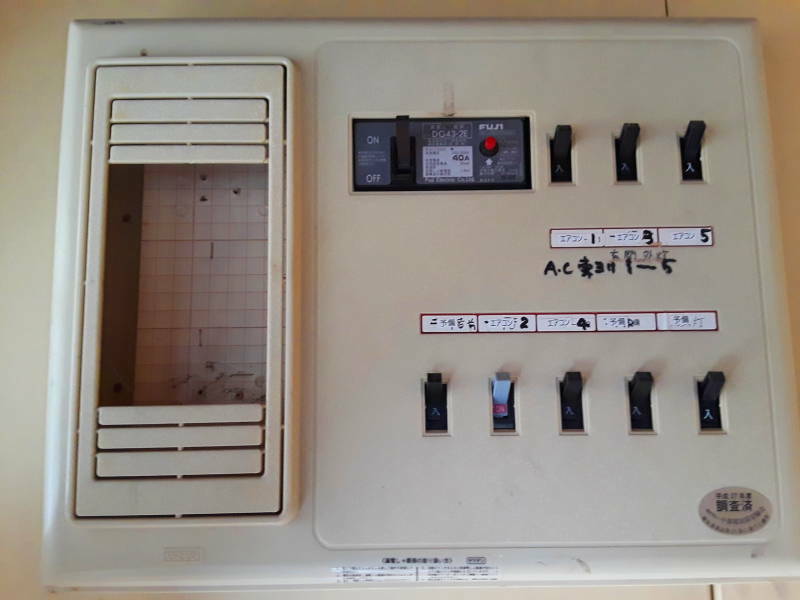 Residential electrical service in Japan is 200 volts center-tap, slightly lower voltage than the 230 V center-tap in the US. So, just 8 kW for the building. But the house is designed and equipped so that 40 A service is plenty. 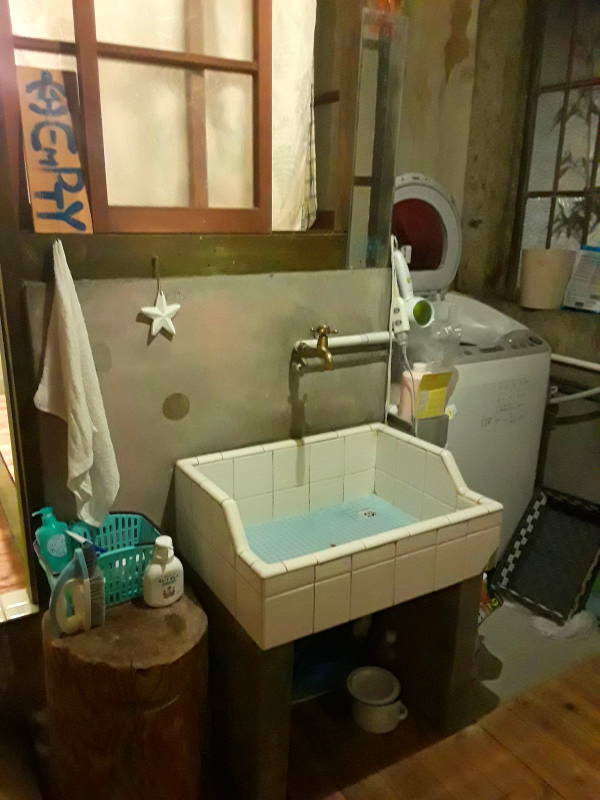 Many houses in Japan have just 30 A service. Some have dual 30 A drops, one for the heating and air conditioning, and the other for everything else. In the U.S., old houses might have 60 A service. The current electrical code requires at least 100 A for new residential installations, and 150 A is the usual minimum. Home 200 A and 300 A panels are commonly available. But, you see, if America didn't use so much electricity, then we wouldn't be able to burn so much coal. Anyway, back to the tour. I've gone upstairs, where the narrow hallway overlooks a small garden. And, my room above, and my bed below. A futon, thick comforter, and pillow. There are stiff white sheets and a pillowcase. One sheet goes on the futon, the other is a cover. You lie between the sheets, the futon below and the comforter optionally on top. There's a light, an electrical outlet, and curtains. 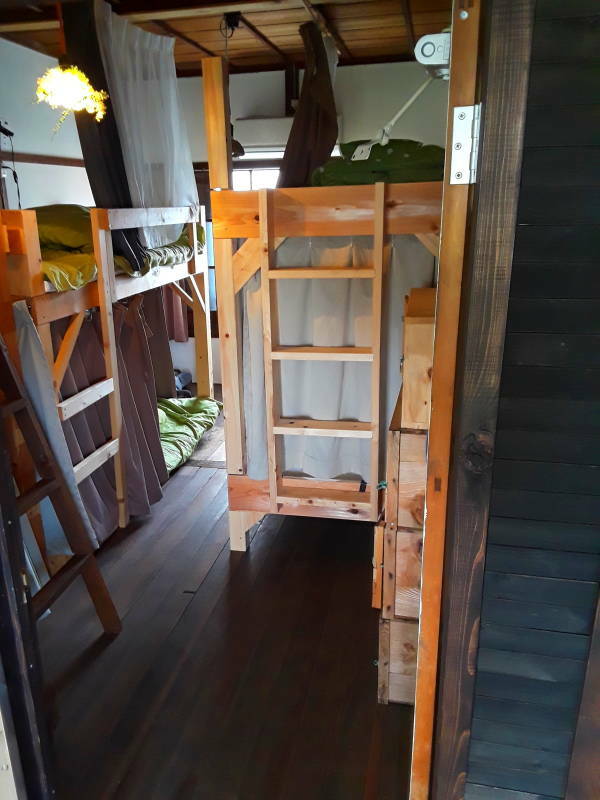 So, the bunks become compartments. It's a little like the old style of railroad sleeping cars. And, a little like the capsule hotels for which Japan is famous. I'm a big guy, and I figured that my feet would always be hanging off the end of the bed in Japan. Not at all! I always had plenty of room. Some bunks or compartments even had enough room to keep your bag at the end of the bed. It's beds in America that are too short for me, especially those in expensive business-oriented hotels. Here are the views from the hallway windows. 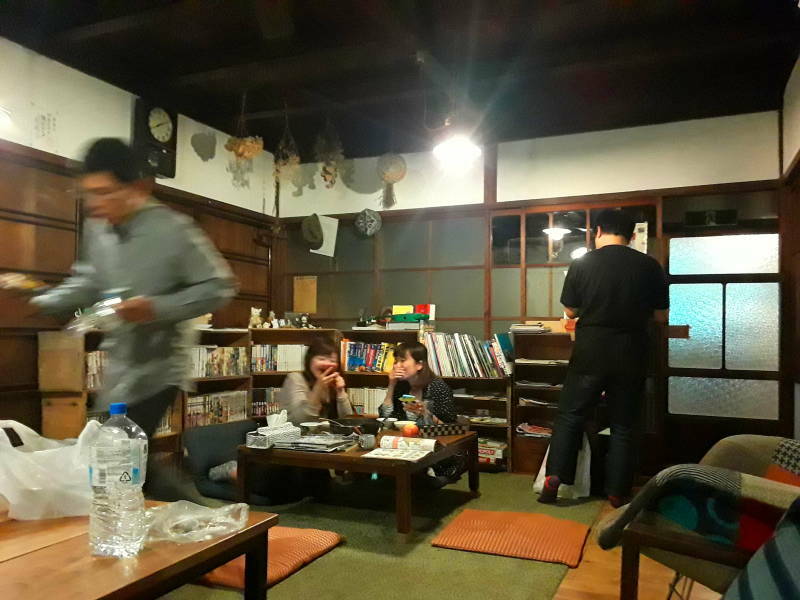 People gather in the shared room in the evening. One other person from the U.S. or Canada stayed there the first night I was there, but she left in the morning. The rest of the time, everyone else staying there was from other parts of Japan. During the Edo Period, the years 1603–1868 when the Tokugawa Shōgunate ruled Japan, an estimated 10% of Japanese citizens made at least one pilgrimage to the Grand Shrine. It's still very popular, especially around New Year's. That is, for Japanese visitors. Ise doesn't have large crowds of foreign visitors. The second evening, two groups of three and four people had arrived. 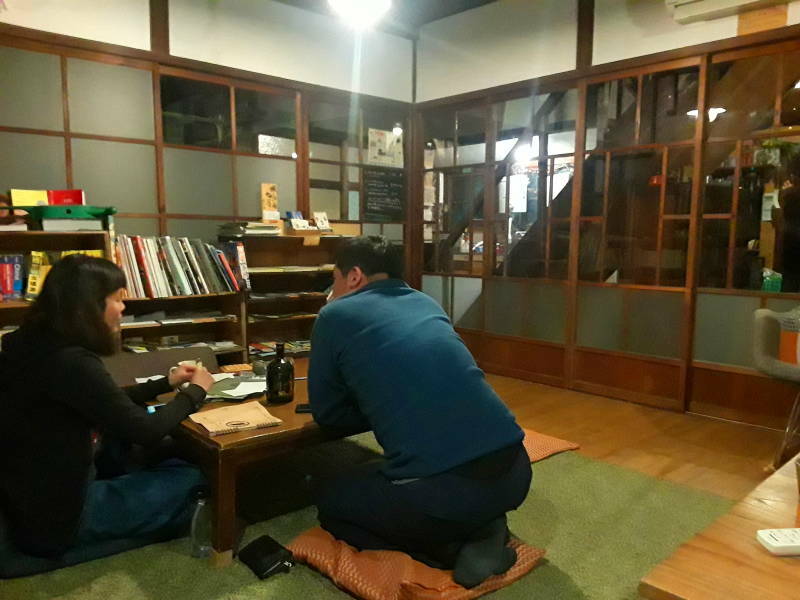 The group of three included a girl who was studying to become a Shinto priest. There are two universities approved to train priests: Tōkyō's Kokugakuin University, and Kogakkan University in Ise. She was studying in Tōkyō. A guy from the other group knew English, and was talking to me. 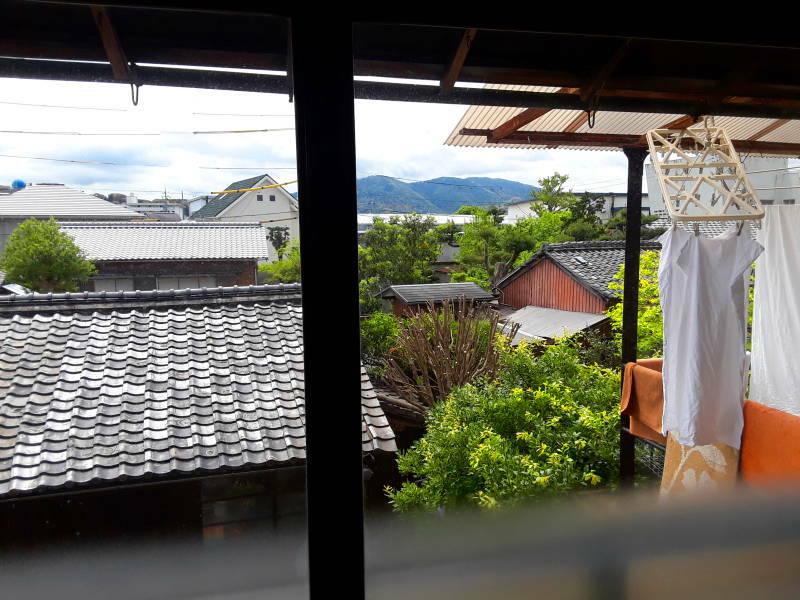 I told him that I had come to Ise because I knew it was more or less the heart of Shintō, which in turn was at the core of Japanese culture. What I was seeing was nice, and interesting, but I still just didn't understand Shintō. "Yeah, me neither", he said. Shintō has no scripture, no overall doctrine, and no known founder. The term kami is ambiguous — it can mean "god" or "deity", or "spirit", but it can also be an element or quality of nature. A view of a lake, or the sound of a waterfall. Ancestors, especially Emperors, can become kami after their death. 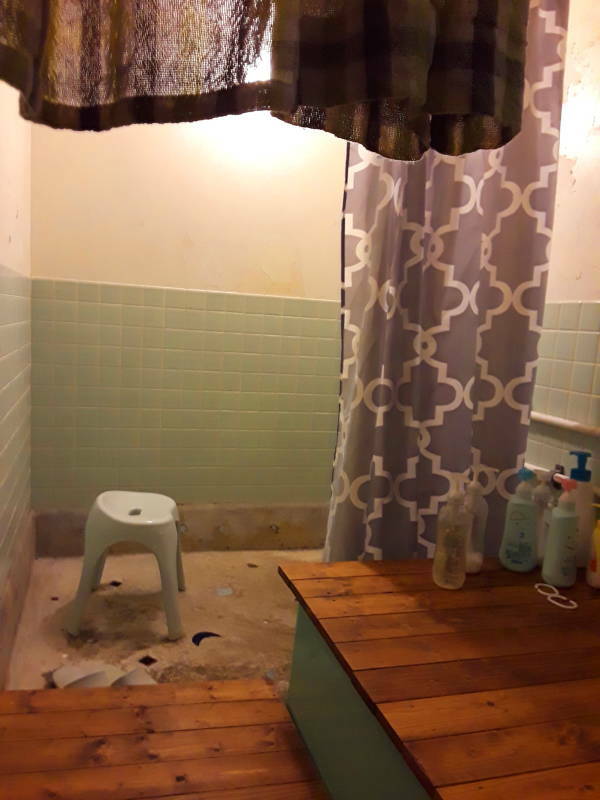 And, above, the spacious shower and bath area. 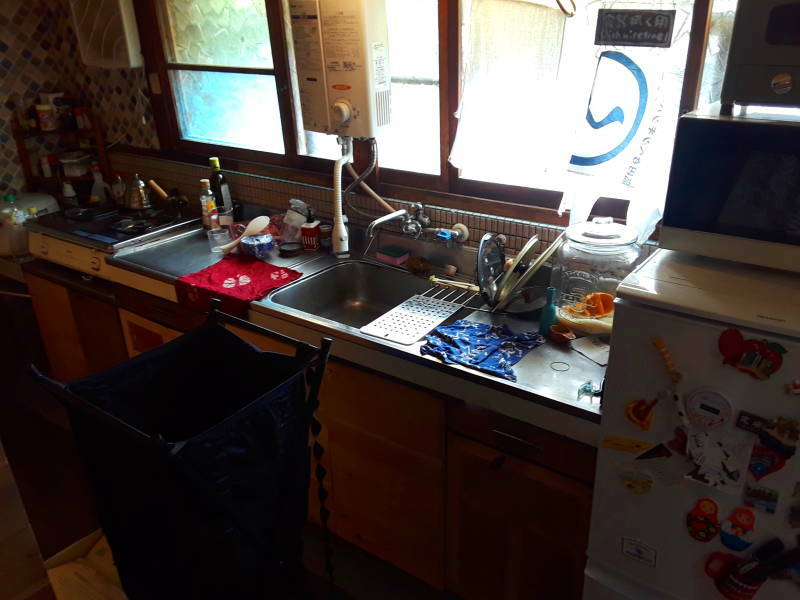 If you need to wash clothes, there is a washing machine and a large sink. My hosts suggested some places for me to go. 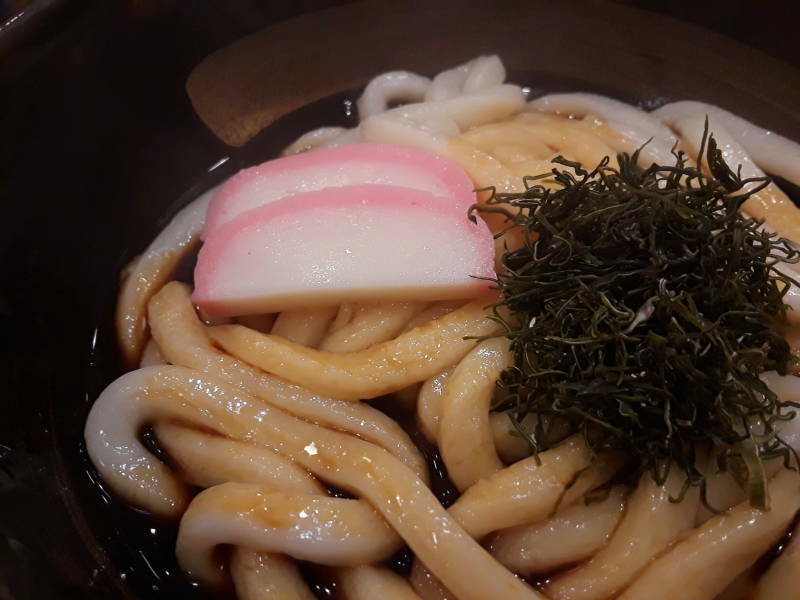 One was a restaurant that specializes in Ise's distinctive dish, soba with soy-based broth. You have many noodle choices. 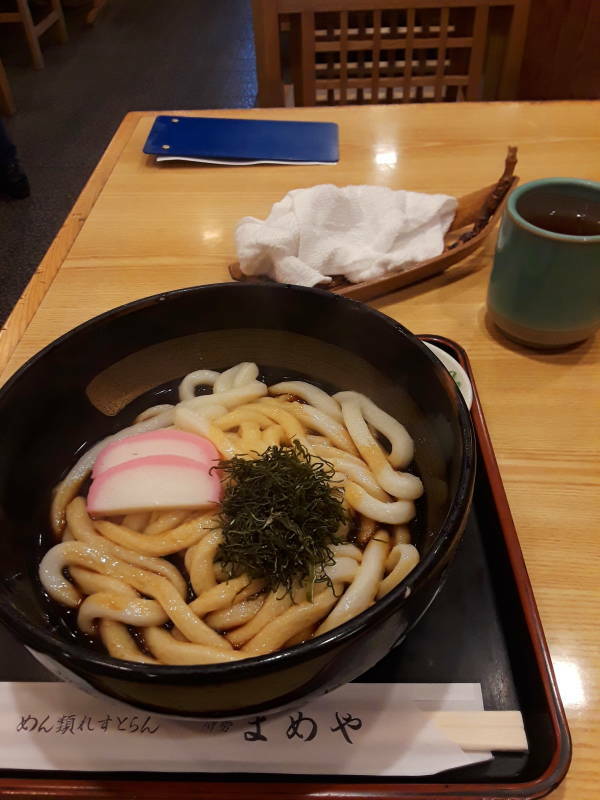 Soba and udon are two types of Japanese noodles. Ramen is originally Chinese, but it's prepared in distinctively Japanese ways here. The corner business above was a good place to get matcha ice cream. 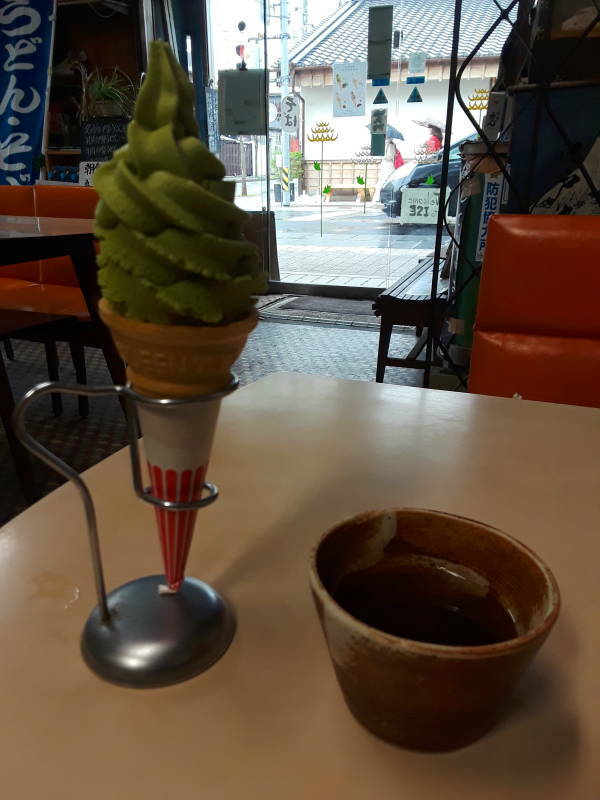 Yes, soft-serve ice cream in intense green tea flavor. There were just a few places to get a meal along the main street in central Ise, running from the train station to the Grand Shrine. None of them had an English menu. I went into one that had "Bar—Cafe" on its sign, but that was the only thing in the place written in Latin script. OK, let me have a bi-ru please, and I'll get to work decrypting the menu. Finally, success! アバカド ドマド サラダ or a-ba-ka-do do-ma-do sa-ra-da. 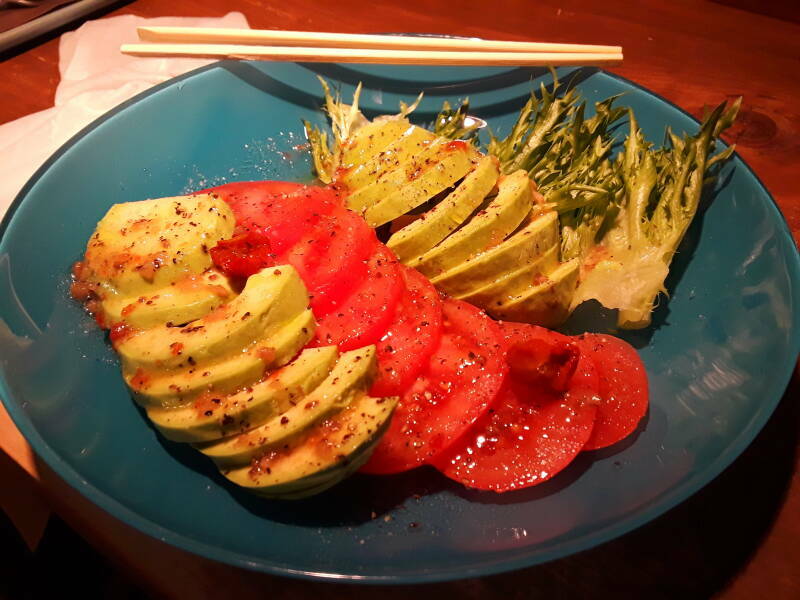 "Avacado", "tomato", and "salad" are foreign words, so they're spelled out phonetically in katakana, the slightly easier syllabary. Hiragana, used to spell out Japanese words, is harder as it's more cursive and complex. The next day I found another cafe-bar that had a French menu, so that was much easier. 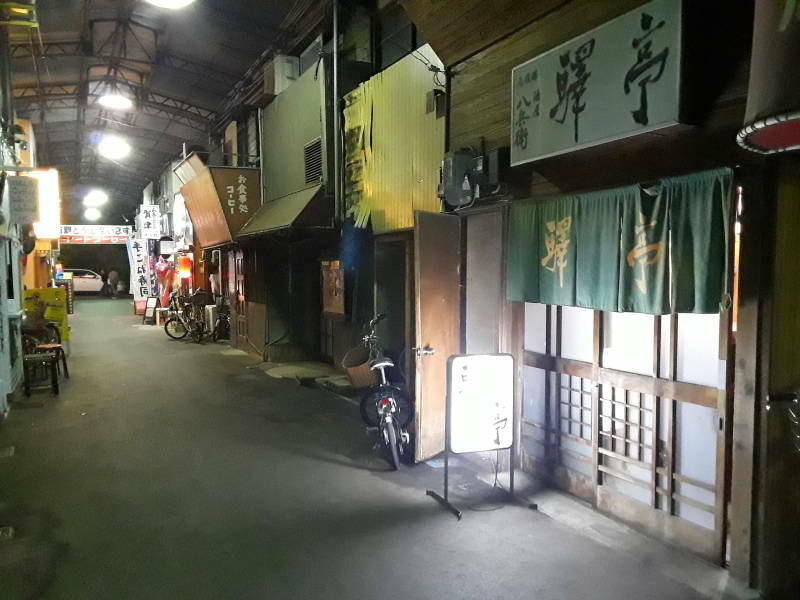 That evening I found where they hid the izakaya alley. It's close to the train station. Nothing opens there until after dark. 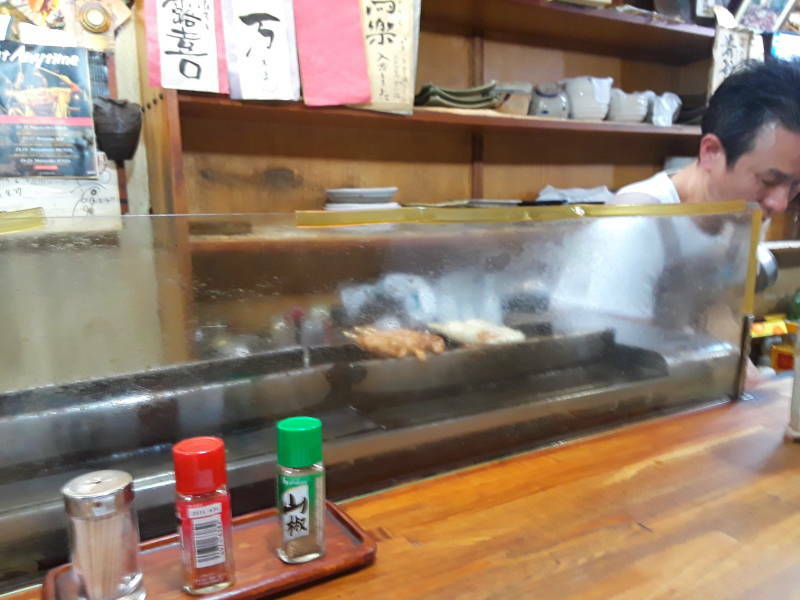 At the izakaya you can point at the ready-to-grill skewers, or point at what someone else is having. 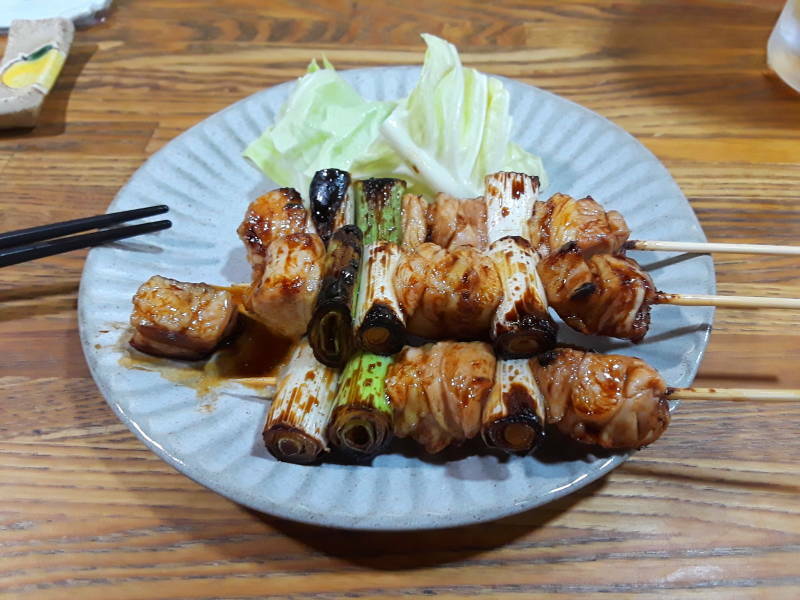 Yakitori is typically chicken thigh meat. It's good combined with onion. These came with some pieces of cabbage leaf. A izakaya will have yakitori or some very similar grilled skewer, and probably edamame, steamed or boiled soybeans. If you can't figure out the posted menu, ask for one of those. 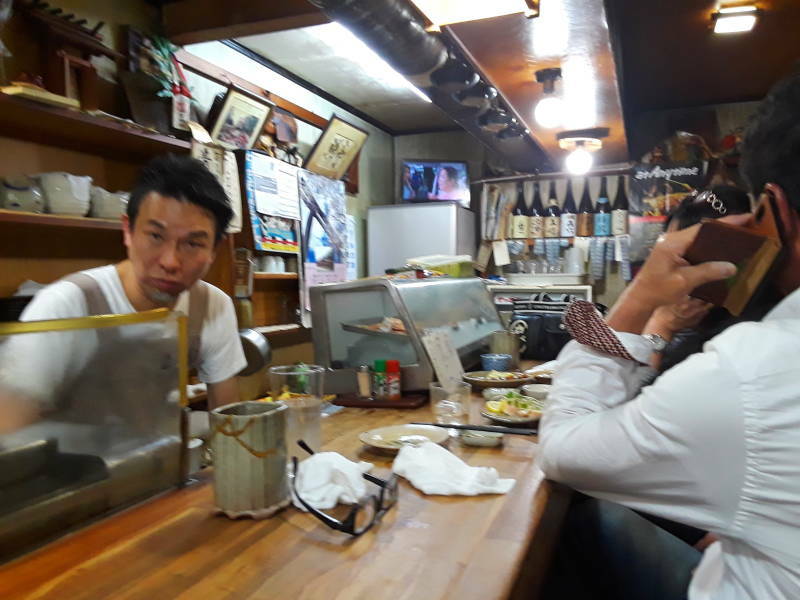 In one izakaya the proprietor told me, "You should get something to drink and something to eat. Don't just drink. That's what English people do. Don't be English." Good advice. After my first night in Ise, the next morning I got an early start to a seashore rock formation representing two of the earliest Shintō deities.